Matt Yglesias thinks that Japan did indeed have two lost decades (1990-2007). But I disagree with the arguments he makes. I believe that 2002-2007 were good years for Japan. 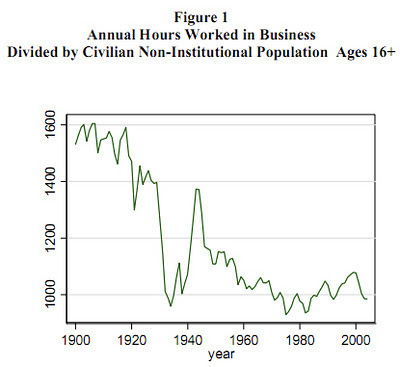 First of all, Matt cites the fact that Japan's employment-to-population ratio fell steadily from 1990. However, this must be weighed against the fact that Japan is aging extremely rapidly. In particular, the retirement of Japan's baby boomers began in 2005, since the retirement age for many Japanese workers is 60, not 65 as in the U.S. In fact, given Japan's legendary culture of overwork, a fall in hours - if it is real, and not simply a reflection of an uptrend in unpaid, unreported overtime - is probably a good thing. Paul Krugman also points this out. Actually, I lived in Japan in 2004 and 2005, and I remember how well everyone said the economy was doing (including the econ professor I worked for). So I agree with Krugman. 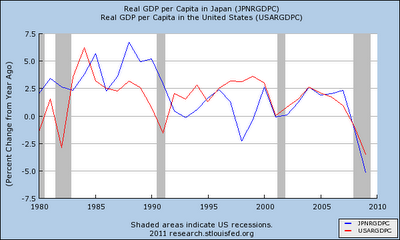 Japan had one lost decade (the 90s), but not two. Update: Krugman also argues that Japan could have done a lot more and recovered a lot faster than it did. I agree with that. But I think that the success of the Koizumi years (early- and mid-2000s) should not be ignored, since it represents probably the best policy experiment we have regarding the effectiveness of quantitative easing. it seems a bit of a stretch to conclude that the whole world suffered a simultaneous lost decade resulting from a simultaneous policy mistake that led to a worldwide aggregate demand deficiency. Really? Look at all the austerian groupthink going on in Europe now in the midst of crisis. Here, too, of course. Given the ascendance of neoliberal dogma over the last decase, it doesn't strike me as bing much of a stretch at all. I'm not sure Japan had even one lost decade. The state of the Japanese economy on the eve of 1991 was crazy in the extreme (Tokyo's real estate valuation had it being "worth" more than the whole US), and at least some of the 1991 to 1995 or so pain was correction of said insanity. But arguing that Japan had a lost decade requires starting in 1990. Seems dizzy to me. Surely the whole developed world did have a lost decade in the 2000's. And, as it happens, it did result from a simultaneous policy mistake (one that is still going on), namely the emergence of a consensus for a too-low inflation target (and its interaction with the high world saving rate along with random shocks to investors' risk tolerance). Even if Japan had returned to full employment (as it apparently did not), the Japanese recovery shouldn't have been considered complete until the inflation rate rose back into the normal range. The Bank of Japan sealed the fate of Japan's second lost decade when it started raising interest rates in 2006 despite a still much-too-low inflation rate. At the time, I was shocked that the BoJ would make such an obvious mistake. Japan's mid-2000s recovery was, I fear, largely due to the temporarily-buffed (via borrowed money) US consumer being able to buy more of their desirable export goods. You can measure any economy by how pleasant the job economy is for young women entering it. In the 1980s Japanese companies were levying vast numbers of women into career positions, but since the bubble women are largely persona non grata in Japan. I happened to have lived in Tokyo 1992-2000. I didn't understand economics then and I still don't now but I do think Japan is a very complicated picture. I can't tell if they're better off than us or not. "But I think that the success of the Koizumi years (early- and mid-2000s) should not be ignored, since it represents probably the best policy experiment we have regarding the effectiveness of quantitative easing." 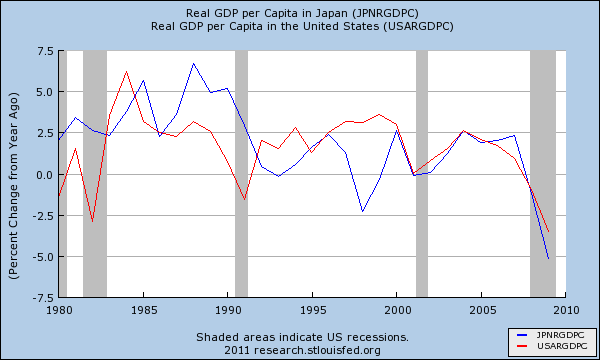 I still disagree with both you and Krugman about Japan reaching its potential by 2007. You make labor supply arguments, which, if anything, would suggest a lower unemployment rate at potential than in earlier cycles, rather than a higher one. Just wanted to say that the first link is wrong. It points to the Krugman blog. "Matt Yglesias thinks that Japan did indeed have two lost decades (1990-2007)." The behavior of Japan's youth unemployment rate over the ('good years' of) 2002-2007 period doesn't paint a particularly rosy picture.